Suddenly, the possibility of rumours becoming a reality did not seem to be a far-fetched idea. The following day, it was indeed reported that Neymar had expressed his desire to leave Barcelona and join Paris Saint-Germain and the Catalan club's administration had granted him the permission to do so. When the news broke out it gripped the city of Barcelona with anger and anxiety as they termed the 25-year old to be a traitor and lashed out at him for joining the French giants for money. What prompted the Barca sensation to take the step? Why did the Brazilian star choose to leave one of the biggest and most successful clubs in the world? Neymar won two La Liga titles, one UEFA Champions League, three Spanish Cups, one Spanish Super Cup and one FIFA Club World Cup with Barca, a huge achievement for any footballer. But his decision to join PSG who finished second in the Ligue 1 and are yet to win a Champions League title raised many eyebrows. Was the record-breaking money involved in the transfer the only motivation behind the Barca star's move to France or was it something that Neymar had his eyes on since a long time. Neymar started his career as a 17-year old with Brazilian club Santos FC and soon caught the eye of the top clubs all around the world owing to his exceptional dribbling skills and clinical finishing. He soon drew comparisons with the best forwards in the world and made the first big move of his career to Camp Nou. Moreover, he made a straight impact for Barca scoring 15 goals in his first season in La Liga cementing his place as the undisputed first choice striker alongside Lionel Messi. In the following season, Barca bagged Luis Suarez from Liverpool, thereby forming an iron-clad attacking trio comprising of Messi, Suarez, and Neymar dubbed as MSN by the Spanish media. Neymar took on the responsibility of occupying the left flank with Messi on the right and Suarez in the middle. 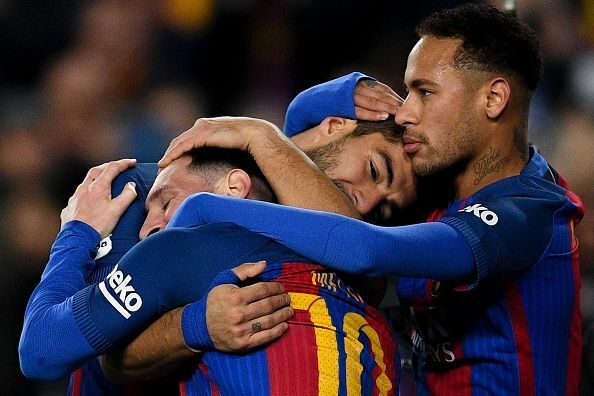 And together, MSN wreaked havoc in their first season with Barcelona winning the 2014/15 La Liga title and Neymar benefitting from Messi and Suarez's presence on the field, scoring 39 goals in all competitions for the club. However, it all changed when Neymar was asked to play a selfless role for the betterment of the team which saw his goals dry out. In the three years that the trio of Messi, Suarez, and Neymar have played together, they have contributed to 364 goals with the Brazilian's contribution being the least in terms of goals with just 90 goals to his name. Meanwhile, Messi and Suarez scored 153 and 121 goals respectively in this period with the most assists coming from Neymar. The last season was a low point in Neymar's career when he ended up scoring just 13 goals as opposed to Messi and Suarez's combined 66 goals in La Liga. The 25-year old was definitely missing out on a chance of adding goals to his name and wasn't able to become a standout player, as he struggled to come out of the shadows of Messi and Suarez. With the opportunity presenting itself and the Qatar-based owners of PSG ready to pay over $250 million to fulfil Barcelona's buyout clause the Brazilian star found it fitting to leave the Catalans in order to further his career as a footballer and become a marquee player himself. Neymar has never won a Ballon d'Or, the most precious title for an individual football player, as the title has stayed between Real Madrid star Cristiano Ronaldo and Lionel Messi. The noteworthy fact here is that both the players play in the La Liga along with Neymar and it is a definite possibility the Brazilian star's talent has been overshadowed by these massive names. Ronaldo and Messi continue to dominate the Ballon d'Or power rankings this year too and the title will likely be bagged by either of them. Goal scoring ability plays a major role in the evaluation of a player for the title and with Neymar missing out on scoring big owing to his role with Barcelona his move to Ligue 1 isn't a surprise with the 25-year old eyeing the Ballon d'Or for himself. The money involved also was a major motivation for Neymar who would be getting $35 million per year while his father who is also his agent will bag a commission in the region of $47 million. The transfer will also go down as the biggest transfer in the history of the game and Neymar surely won't mind being evaluated at a hefty $263 million approximately. On the other hand, a revamped PSG side is waiting to welcome the Brazilian star along with his compatriot Dani Alves. With Marco Veratti in-charge of the mid-field and Edison Cavani and Angel Di Maria spearheading the attack alongside Neymar, the Brazilian will have enough support to make history and finally become the main man he has always craved to be.